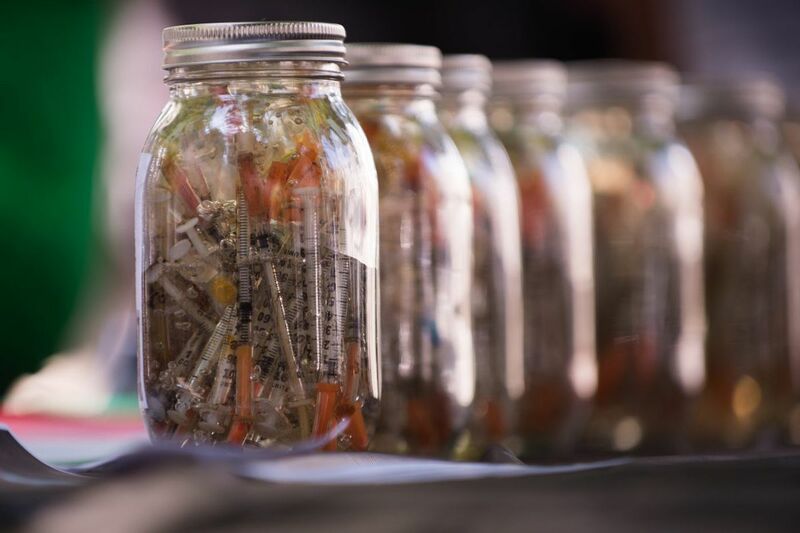 Jars of needles and other drug paraphernalia collected from the streets of Kensington displayed in June at City Hall to raise awareness of the opioid crisis. At 26, Bo Garfield has already been in two fights for his life: one with thyroid lymphoma and the other against substance-use disorder. The harder-fought battle? Heroin addiction. When Garfield needed cancer treatment, it was readily available. But substance-use disorder was tougher to overcome for many reasons — not the least of which is the prevailing stigma surrounding addiction. With a worsening opioid epidemic sweeping the nation, now is the time to break that stigma. It starts with the way we talk about people with addiction. As a journalist, I spent most of 2015 immersed in the opioid crisis in Philadelphia, working on an in-depth report, so I have an insatiable appetite for news coverage of the epidemic. But almost every story I read leaves me disappointed. There is incredible, boots-on-the-ground journalism happening, yet I still stumble too often on repeated use of words such as addict, user, or worse to describe people with substance-use disorder. Language is an important way to avoid that harm. "My biggest thing, as someone in recovery, is, 'I'm not my disease,' " said Devin Reaves, a recovery advocate who has been in recovery for a decade. "We wouldn't say, 'That person is high blood pressure.' "
No one has ever called Garfield a cancer. But he has sure as hell been called an addict. "What I don't like is the whole argument of whether it's a choice or not," said Garfield, who has been in recovery for nine months. He got hooked on painkillers after a car accident at 17. He knows better than anyone it's not a choice. Addict removes humanity from the equation. It absolves us of the responsibility to view people with addiction as that, people. With people dying of overdoses roughly every 10 hours in Philadelphia, we don't have time to keep treating humanity and addiction as if they're mutually exclusive. Substance-use disorder is widely recognized in the medical and public health communities as a disease, and other fields are following suit. The Associated Press style guide, followed by most news organizations, recently recommended that journalists use person-first language in reporting on addiction. Language is important not only because it influences how the public perceives people with substance-use disorder, but also because fear of being stigmatized can mean the difference between whether a person seeks and receives adequate treatment. A study by Harvard University professor of psychiatry John Kelly published in 2010 found clinicians were more likely to respond punitively when people were described as substance abusers than when they were called people with substance-use disorder. Reaves agrees that the way addiction is talked about also affects people in treatment and recovery. "It's never described in positive terms," Reaves said of language often used to describe addiction. "It leaves me feeling like I don't stand a chance." But he did. And so do the tens of thousands of other people fighting this epidemic. Morgan Zalot is a former reporter for the Philadelphia Daily News and NBC10. She is pursuing a master's degree in public health at Temple University.